Sant Shree Sevalal Maharaj was born on 15.2.1739 to parents Shri Dharmani Yaadi (mother) and Shri Bhima Naik on this holy land around 271 years back. At that time this location was popularly known as Ramagundam or Ramji Naik Tanda (Ramji Naik is grand father of Sevabhaya, who come to the location with 360 families of his Tanda and about 4000 loaded cattles). Ramji Naik Tanda when deserted by the end of 18th century, the local people built a village known as Chennarayani palle. This land now falls in the revenue village of Peddadoddi, Taluk / Mandal - Gooty, Dist. Anandpur, Andhra Pradesh. Pohra Devi is 110 KM from Akola City. Every year on pious occasion of Ram Navami this fair open and Banjara men with their wives and children get together to obtain blessing of their Mother Goddess and to have Prasad from their Guru Sevadas Maharaj. On every Ram Navami day this fair starts with its peculiarity. 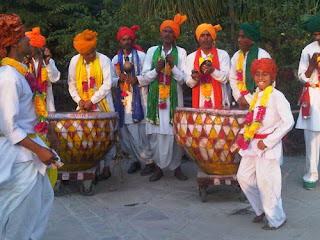 Every year in Pohra Devi village on the occasion of Ram Navami Banjara Fair is held. Pohra Devi is a very small village situated maharashtra State. In this tiny village there is one old temple of Goddess Amba. Around this temple Banjara people, who come here to attend the fair, erect their temporary tent. Baba Haathiram Ji was North-Indian by birth. He came down to South. In Tirupati, he constructed a small Math and settled. Every day he used to worship the Lord of the Seven Hills. Sri Venkateshwara was pleased with his devotion and used to come and play dice with him. One such day he forgot his necklace there and returned to his Sanctum Sanctorum. Babaji noticed it after Swami Ji left his place. He wanted to hand it over to the Lord. He started to the temple. In the meanwhile priests of the temple observed that the necklace was missing. They complained to the authorities. In the meanwhile Baba ji arrived and handed over the necklace to them. When questioned he answered with all innocence that the Lord had forgotten it in his Math. They did not believe him, and wanted to embarass him. So they locked him up in a room with ten kilos of cooked rice and ten bundles of sugarcane and challenged him, "If you really are like an elephant you must eat every bit of this food by day-break". Within five minutes of being locked up Hathiram Ji Baba, having consumed the ten kilos of rice and the ten bundles of sugarcane, kicked the locked doors to pieces and stepped out trumpeting like an elephant. Hathiram Baba's Math exists even today opposite the temple and its a Jiva-samadhi. The scenes of Hathiram's game with the lord is depicted on the doors to entrance of the temple. Peoples from all India worship SHRI SATI MATA JI & SAMAT DADA JI. A big Mela is celebrated in the memory of SHRI SATI MATA JI & SAMAT DADA JI on every Magh Shudhha Poornima (once in a year). Specially People belonging to Dhanavat-Palathiya (Chauhan clan) worship Samat Dada ji and Sati Mata ji. There is a temple at Vadangali village, Tehsil Sinnar of Nashik district of Maharashtra State, India. It is their place of worship. It is a Legend that the son of a Samat named Dhanawat denounced the worldly life and became a sage. His disciple named Sati Mata ji (Bhaga) was pure vegetarian lady from Brahmin community. The Sati Mata ji is first worshipped in the morning. Some sweet items (Lapashi or Rice without salt) are offered to Sati Mata Ji. It is said that she was unmarried. Her flag is white in color. After her worship is over the Samat Dada is offered the Bali of GOAT (Bakra Bali). The wife's name of Samat Dada ji was Dasma Mata ji (from our Banjara community), On the day of Magh Shudhha Poornima Samat Dada ji, converted himself in Stone with his favorite Dog, and Dhadi (a Dhadi is working and helping to Banjara communities Head Person), Kaala and Baala two assistants of Samat Dada ji . Suddenly after Samat Dada ji and 4 others converted as Stone, Sati Mata ji throw himself in Fire . 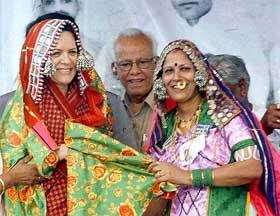 The girls of Dhanavat-Palathya (Chavan clan) are not given share of this offering. If any girl eats the offering by mistake it is believed that the Samat Dada ji follows her after her marriage. The color of the Samat Dadaji's flag is Red. A red flag is shown in front the house where Samat Dada ji is worshipped. Khechdi Tree (Shami /Saundad in Marathi Language) is very old and Holy tree in the Temple of Sati Mata ji. Mata Desan Devi Memorial Annual Festival was completed successfully at Mata Desan Devi Temple, Brahm Sarovar, Kurukshetra on June 18, 2009. Thousands Goaars from Punjab and Haryana paid tribute to Daadi Desan Devi Ji. Different food stalls were installed to serve food to the devotees of Mata Desan Devi Ji.